The first monograph devoted to this great Italian artist. Franco Angeli was one of the leading figures in the Italian art of the postwar period. Often labeled superficially as "Pop," he is revealed here, through new documents and studies, as an artist who took a surprising and unprecedented approach to his work. He made his debut in the fifties in a still little-known experimental Roman laboratory where the new generations encountered the masters of Italian art. 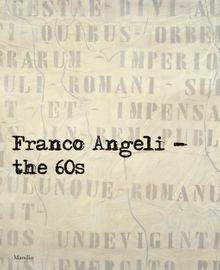 This book reconstructs the stylistic and artistic reciprocities and the relations of Angeli with his friends and colleagues up until the sixties, a time when, with his attainment of an existential image that was at the same time deeply polemical and provocative, his work developed along versatile lines, in an original dialogue with the international context. Paperback, 11 x 9 in. / 280 pgs / 158 color.